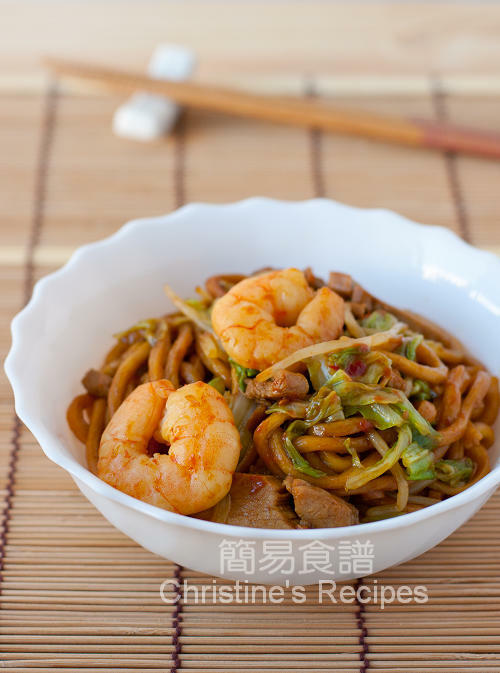 As a famous Chinese food critic 蔡瀾 stated on his blog, the original version of Hokkien Noodles is hardly found in Fujian (福建) province, China nowadays. The dish has become a fusion styled, deep black in colour served in many modern Malaysian restaurants. The underlined meaning of his post is that the original version of Hokkien Noodles was not as black as we see in today’s restaurants. Yet people are still arguing about the way how this noodle dish should be cooked. Well, as a home cook, I can take the advantage of modifying and twisting the cooking way as I want. If you like darker noodles, put more dark soy sauce into the sauce then. 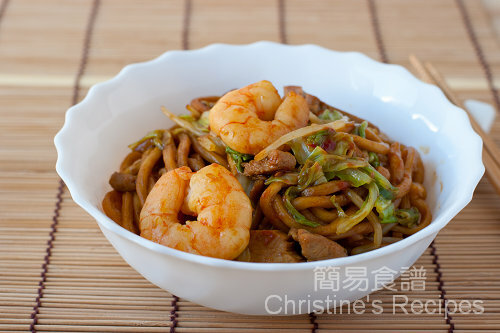 When it comes to cooking Hokkien noodles, the very basic thing is quite simple. The Hokkien noodles have to be simmered in long-cooked, tasty stock, so that the noodles absorb all the flavours. Many Malaysian friends of mine use shrimp shells to make the broth. I just simply use the ready-made chicken stock to cook the dish on the go. It turned out to be a simple and quick lunch for my family. Blanch noodles in boiling water according to the instructions on the packet and rinse away any access oil. Drain well. Mix pork with marinade well and leave for 20 minutes. Heat oil in wok or frying pan over medium heat. Add pork and stir fry until cooked. Set aside. Add bean sprouts, cabbage and cook until soft. Set aside. Add more oil in wok. Toss in Hokkien noodles. Pour sauce over the noodles and stir to combine. Simmer for a few minutes until the noodles absorb the flavours of sauce. Add prawns, pork and vegetables. Cook until the prawns are almost done. Add BBQ pork. Taste by your yourself. Add soy sauce or salt if necessary. Dish up and serve hot. This dish is actually found in many hawker restaurants in Malaysia. One of my favourite hawker food! Yeap! We all have our versions of noodles dishes in our Asian homes. I really love your photography. Your bowl of noodles reminds me a lot of the noodles that restaurants served from leftover peking duck. gorgeous! I never tried the dark-version of Hokkien noodles of Malaysia but I have seen photos before. Yours looks like the real deal. Wow, Christine! Your noodles look so so good! Just like the KL style one. Delicious! Wow! You made this Malaysian-Hokkien classic!! Actually, it's one of my faves, alongside 滑蛋河粉 and 滑蛋鴛鴦. But then, the 福建麵 I'm used to is darker though. Your "dark soy sauce" here refers to 老抽, right? I think 晒油 gives it a darker color with the almost the same quantity called for. And, 豬油渣 is almost ubiquitous in this dish ... at least, for ours here in Kuala Lumpur. I'll try making this when time allows. Really no time nowadays. You know the life of hectic urbanites. LOL! Yum I have gotta try this, I dont know Choi Lan has a blog. I'd not even know the difference with the various versions. All I know is that that photo looks absolutely delicious and I cannot wait to give it a try. Simply a delicious comfort food! I love it. i gotthis from sydeny, george st in the shop named Petaling Street...Malaysian cuisine....yum too!!! Lucky you, Teng. You've got a malaysian restaurant nearby. Some time, some how, you'll want to make one yourself.